Samsung mobile just announced some new feature phones aimed at the developing markets. 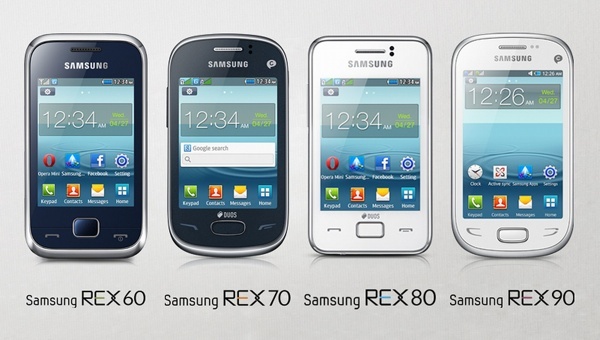 The phones form it's REX portfolio which offers a touchscreen display with TouchWiz and supports up to 11 Homescreens . The REX 70 has a 3.0-inch, QVGA resolution display, 2 megapixel camera, 10MB memory with microSD card slot, dual-SIM support and 1,000mAh battery. Other features are similar to REX 60. The REX 80 has similar features as the REX 70 but a higher resolution 3 megapixel camera, 20MB memory with microSD card slot, Wi-Fi 802.11b/g/n and 1,000mAh battery. The REX 90 has a 3.5-inch, HVGA display, 3.2 megapixel camera, 10MB memory with microSD card slot, dual-SIM support, Wi-Fi 802.11b/g/n and 1,000mAh battery. The REX-60 would cost $79 that's about N13, 000 and the REX-90 would cost about $120 or N19, 000 when it finally becomes available at the retailer shops.